lassen sich gut verwenden, wenn man sie in Wasser auflöst und zum Beispiel in einer Plastikspritzflasche als flüssige Seife zum Händewaschen gebraucht. 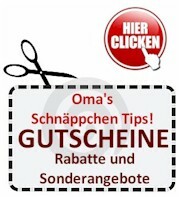 This entry was posted by Oma on Samstag, September 20th, 2014 at 6:30 am	and is filed under Haus und Garten, Sparen im Haushalt. You can follow any responses to this entry through the RSS 2.0 feed. You can leave a response, or trackback from your own site.